This entry was posted in All-Ireland, Hurling, Waterford, Waterford gallery and tagged Croke Park, Kilkenny on 10/08/2015 by deiseach. A problem it shares with the Sunday Game. 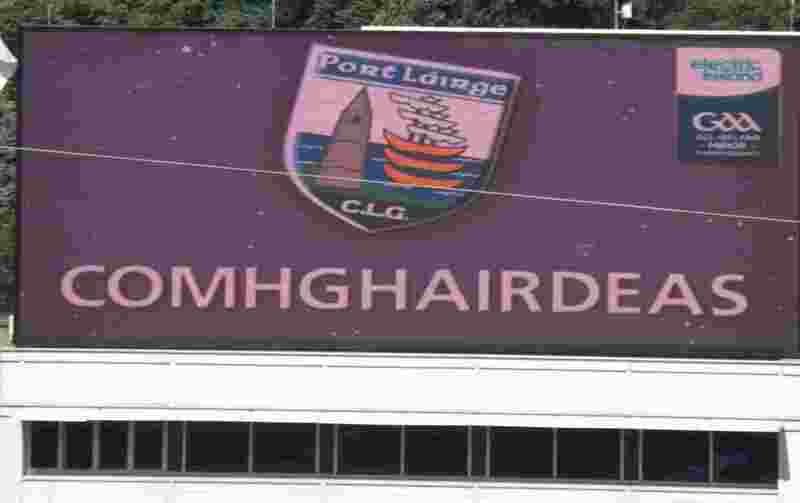 This entry was posted in All-Ireland, Hurling, Waterford and tagged Kilkenny on 10/08/2015 by deiseach. There’s been a lot of discussion over the last few weeks on boards.ie about the looming absence of Séamus Callanan from the Tipperary team to play Waterford in the League semi-final. The consensus opinion was that it would be a better test of Waterford’s mettle if the free-scoring Tipp forward was present, particularly given the seemingly eternal concerns over our full-back line in the face of goal scorers. While I would be of the opinion that anything that enhances Waterford’s chances of success is a good thing, even in the much-maligned League – a day may come when we are so flush with success that can afford to look on it with disdain, but Sunday is not going to be that day – I could understand the logic of the position. It isn’t just a question of whether we have the personnel, it’s whether an entire system, one with the potential to transform our prospects and even the entire game of hurling, is really what we hope it is. Better to find out now that dream of making the Donegal-style tactics work in hurling is a pipe dream rather than later on when there is no chance to rectify it. A lot of people will be satisfied then to see Callanan has been successful in his appeal against the red card, and there will be a lot of overlap with the subset who thought he didn’t deserve to get sent off in the first place. But while I can understand the position of the former, seeing the latter makes my blood boil. The issue at stake isn’t whether Callanan deserved to get sent off. The only question that should be considered by the authorities in any appeal is whether the rules were correctly applied. If the referee judged a player to have struck an opponent with the hurley and a review tells us that the player struck an opponent with the hurley, even with minimal force, that’s a red card. This includes the marching orders given to Michael Walsh and Shane O’Sullivan in the League last year, and the mild tap that resulted in a red card for John Keane in the 2012 Munster club final. Yes, they were harsh decisions. But as long as the referee is applying the letter of the law, you can’t claim you were hard done by. Let that be a lesson to you to show more care next time. That big piece of wood is for hitting the ball, not your opponent. So how did Seamus Callanan get off the hook while the aforementioned Waterford* trio did not? I don’t think it’s far-fetched to suggest that there is one rule book for the Big Three and one for the rest of us. Recently we were all united in acclamation of King Henry. It was probably understandable amidst all the hosannas that no one saw fit to question why he felt the need to refer to the red card he received against Cork in the 2013 Championship. As with all of the red cards I have mentioned here, it was a hard call. But there was nothing substantively wrong with it, so the hysteria which greeted it could only be explained in the context of who it had happened to, not what had happened. The idea that it was a blot on his reputation was ridiculous. Countless players have been sent off over the years and no one bothers mentioning it come retirement. Yet not only did Henry feel the need to bring it up upon his retirement, he managed to make us aware of the fact that he had been sent off before in an obscure Minor game, so his reputation was well and truly in the toilet anyway, right? That same summer, we had a similar ho-ha over Pat Horgan’s red card in the Munster final against Limerick. The result was the same – red card rescinded. You can see the pattern emerging. Maybe you don’t think that’s fair, the suggestion that players from the Big Three are getting treated more leniently than those from the other counties. There are plenty of examples out there of harsh decisions against Kilkenny, Cork and Tipperary players that were not overturned, and perversely the pattern would suggest that referees are happy to hand out cards to the biggest names without fear nor favour. After all, they don’t come any bigger than Henry Shefflin. But how else can you explain the strict support for the final word of the referee in the cases of Keane, Walsh and O’Sullivan and the after-the-fact undermining of them that took place in the cases of Horgan, Shefflin and Callanan? At best, it’s too small a sample size to be significant and the authorities are making it up as they go along. At worst, they are so starry-eyed by the big names from the big counties that the entreaties about shure he’s a grand lad who would never harm a fly gain traction. 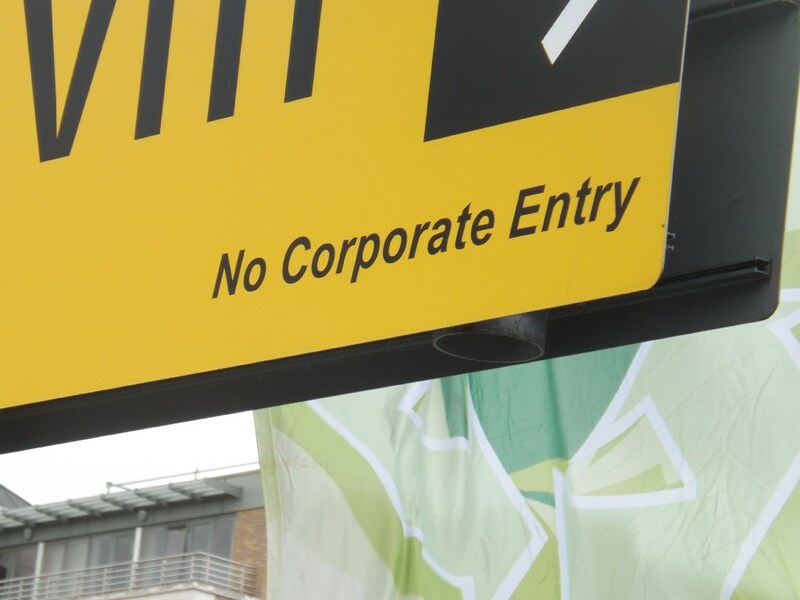 Whatever the truth, it’s not good when it comes to a supposedly rule-based endeavour. *I believe John Keane is from Tipperary, but if you are playing for a Waterford club you are not representing Tipperary. This entry was posted in Hurling, National League, Waterford and tagged Cork, Kilkenny, Tipperary on 18/04/2015 by deiseach. 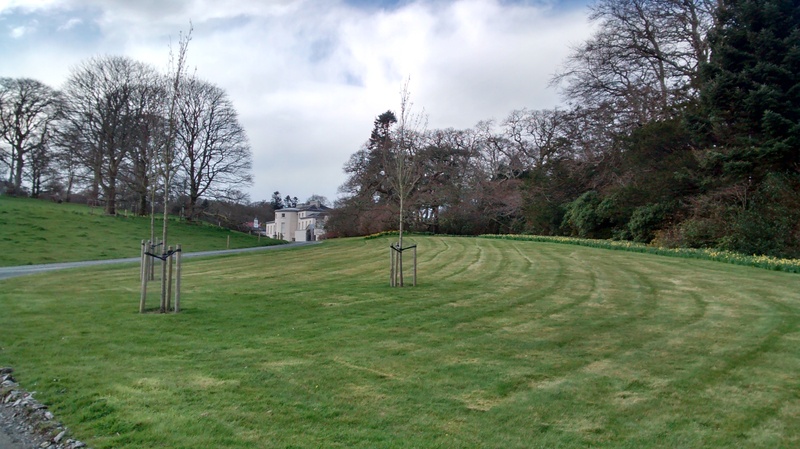 Last Saturday we did something we have been long planning: we went to Mount Congreve. I’ve seen and heard a lot of hype about it over the years so my expectations were high and am happy to report it was even better than I could have hoped. We’ve been to many stately piles in these islands with grand gardens attached over the years and this was a match for any of them, a perfect marriage of nature and artifice in a glorious setting, I couldn’t help but feel a shiver of local pride as I gazed across the Suir at the relatively uninspired countryside opposite. This was what Tolkien must have envisaged when he pictured Aragorn looking from Caras Galadhon at the lands surrounding Lothlórien. Unfortunately that was as good as the weekend got for Co Waterford as the hurlers sank to a crushing defeat at the hands of the denizens of the aforementioned uninspired countryside. Like Orcs they are, Orcs! The numbers tell their own tale. The 20-point defeat slots comfortably into the top ten of hidings we’ve ever received in the National League, and you have to go back to the 1988/9 season to find the last time we shipped beatings of ten points or greater in two successive League matches. You often see Waterford supporters bemoaning narrow defeats as if they are as bad as batterings – no more moral victories etc – but these last two results demonstrate the folly of such nihilism. If you consistently keep the scoreboard tight then occasionally you’re going to come out on the right side of results. When the opposition are regularly able to run up scores in excess of thirty points, you can forget about snatching games every now and again with a late surge or a last minute goal. And the numbers don’t even tell a fraction of the tale. I missed the first half – I know, I’m a jinx – and was treated to an absolutely ghastly second half on TG4. On a couple of occasions early on a Waterford forward managed to put the head down and set off towards goal only to be easily dispossessed by the Kilkenny backs. At the other end the goals had a horrible inevitability to them, forwards pirouetting around backs and leaving Stephen O’Keeffe totally exposed. By the time the third goal went in heads went down all around the pitch, and if Kilkenny had been so inclined it would have been far worse than the NHL nadir back in 1957. At least it wasn’t a 23-point defeat to Kilkenny. That would have really got tongues wagging. It can get much worse too. Again, you’ll probably have people saying that Division 1B isn’t so bad, that we could regroup and notch up a few victories a year against weaker teams, and I think it’s fair to say that, in itself, life in Division 1B isn’t that bad. There are enough decent teams in there that it isn’t the dropdown that falling into an eight-team second division might be, and it might be nice to freshen up the array of teams that we play each year after several years of painting-the-Forth-Bridge efforts against the likes of Kilkenny and Tipperary. There’s a potential pincer movement at work here though. After several near misses you can imagine Limerick would be well up for showing us who was boss, Wexford seemed to have bottomed out, Laois are definitely on the way up . . . in fact, they’d all see us as vulnerable. There probably wouldn’t be any 20-point massacre, but we can forget about a quick return to the top table. Thankfully we’ve snatched a home draw against the Dubs but there are testing times ahead for Derek McGrath and company. Perhaps a soothing trip to Mount Congreve in advance of the game is in order? This entry was posted in Hurling, National League, Waterford and tagged Kilkenny on 24/03/2014 by deiseach. Early in the second half of this game, I gave up trying to put together any meaningful record of events. The first half had featured a harum-scarum performance from Waterford, so lacking in a plan that even the thought of just getting the ball into Stephen Bennett at every available opportunity, an unimaginative plan but one that would have at least been coherent, seemed beyond them. I put my camera down and waited. The narrative would come to some kind of conclusion without my intervention. With all that in mind, here’s a meaningless record of my day in the smoke. I had been determined beforehand to just enjoy the experience. A combination of our dire record in All-Ireland semi-finals (one win in twelve attempts at Senior, Minor and Under-21 since winning two against Antrim in 1992) and my record in Croke Park (one draw and eight defeats since seeing us beat Galway in my first ever visit to Headquarters in 1998) meant I wasn’t filled with optimism. We were going to head up and support the boys then enjoy the second game, which looked rather tasty. Such feelings of bonhomie were aided by a picaresque scene on the Luas as a lovable Dublin gangster went about his day. I say ‘lovable’ as he spent a good two minutes talking to a Cork supporter about last week’s football game while she was talking about the hurling match that day. I say ‘gangster’ as he then got on the phone to advise someone that while he was sorry about the way things were going with the person at the other end, he had to talk to some third party who had grassed him up. He didn’t want to fight with anyone but this needed to be ‘sorted’. This line of conversation went around three or four times to increasingly broad grins from the overhearing culchie contingent. I must remember to check whether there were any gangland shootings in Dublin on Sunday evening. Arriving at Croke Park before the gates had even opened, I got a little emotional upon seeing a couple with their Waterford jersey-clad children. They were aged somewhere between 7 and 9 (the children, not the parents) and had the wide-eyed look of those on their first trip to Jones’s Road. It struck me that there was no guarantee that when my son is their age (six weeks old at the time of writing) he will be able to experience this kind of outing. The man on the loudspeaker in the kids area under the Davin Stand wondered whether there was anyone left in Waterford while also spotting a lone Carlow jersey. Not much call for Carlow folk to be in Croke Park in August. Despite the woeful records I referenced earlier, these are still days to be treasured. We took up our seats in the Canal End Davin Stand and opened the programme I had unthinkingly purchased. Oh. 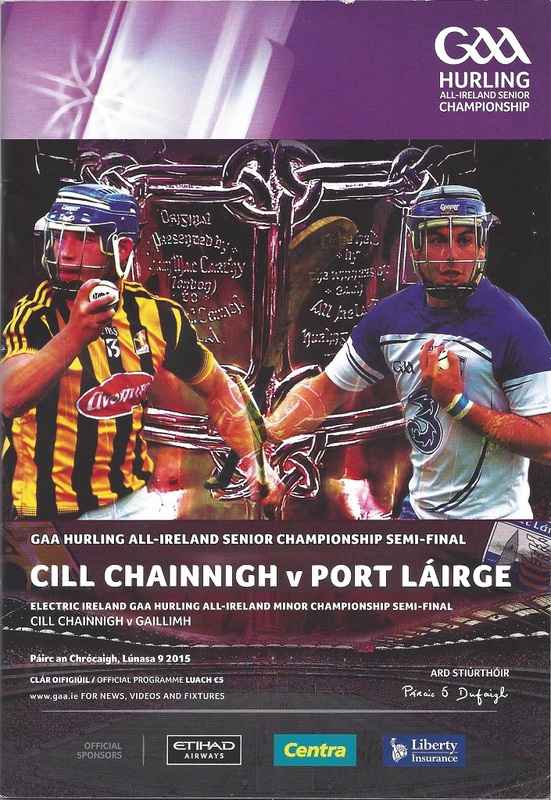 Four pages on the Minor game. Who knew there was so much more emphasis on the main feature? Still, it was noted by one of my siblings that the Waterford player from Bonmahon on the starting lineup (Micheál Harney) and from Tramore on the bench (Barry Whelan). It was likely both of those players had been on the field during the Three-Minute War. A long way from there to here. The match began and it was clear that Waterford fans outnumbered those from Kilkenny by a multiple of several. This was good, but it would be remiss not to doff a cap to the Kilkenny people who made the journey. This was my first All-Ireland Minor semi-final. Your average Kilkenny supporter will have had double-figure opportunities to see the Kittens (groan) so the people who were here on this day for Kilkenny really do care about the game. And they had more to cheer about early on. Waterford, to be frank, were crap. Kilkenny players were first to every ball and promptly winning frees which were slotted over with considerable élan by Alan Murphy. 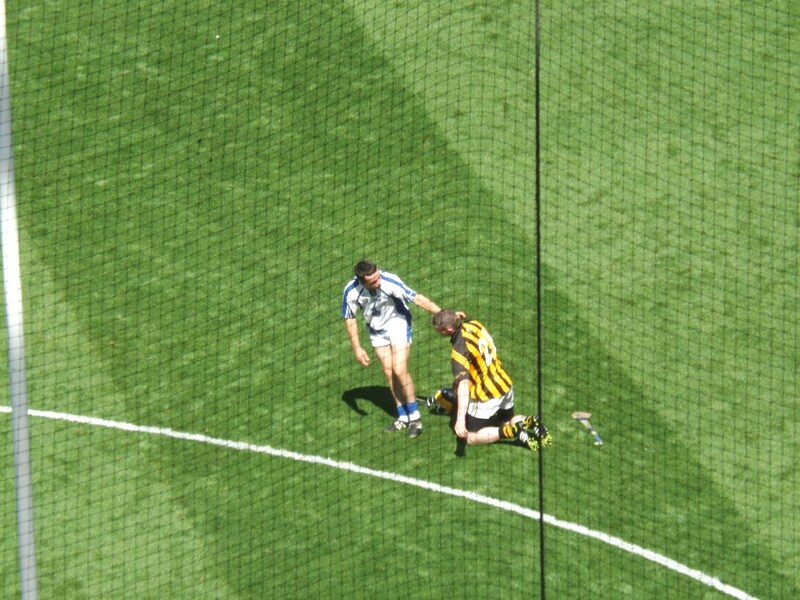 There was some grounds for irritation in Waterford circles at the ease with which the referee was blowing his whistle – if you got ahead of your man, all you had to do was hit the deck and you had the free – but there was no doubt most of the frees were justified as Waterford struggled to get going. As I said earlier, there seemed to be no plan, not even one of getting it into Stephen Bennett post-haste. And when they did, lo! he worked the oracle, breezing past two Kilkenny defenders before drawing the goalkeeper and lobbing the ball into the onrushing Adam Farrell to bat the ball into the empty net. Great stuff, and Waterford could have had another goal moments later but Farrell went for a point from a narrow angle when he really should have made the goalie work and the ball went wide. It was better from Waterford, even if they kept on giving Kilkenny too much space, space which ended in a free and a score from Murphy. It made for frustrating viewing, but while there were signs that while Waterford were struggling to win clean possession they were having no such problems winning the loose ball. I’ve fretted on a previous occasion about how midget-like Waterford players are at this level, but this team looked much more robust and it was by a demonstration of teak-tough play and no little skill that Waterford got their second goal, DJ Foran bursting onto a loose ball out on the 45 and zipping through the Kilkenny back lines before cracking the ball in off the stanchion – it rebounded out but was tapped in anyway, just in case. 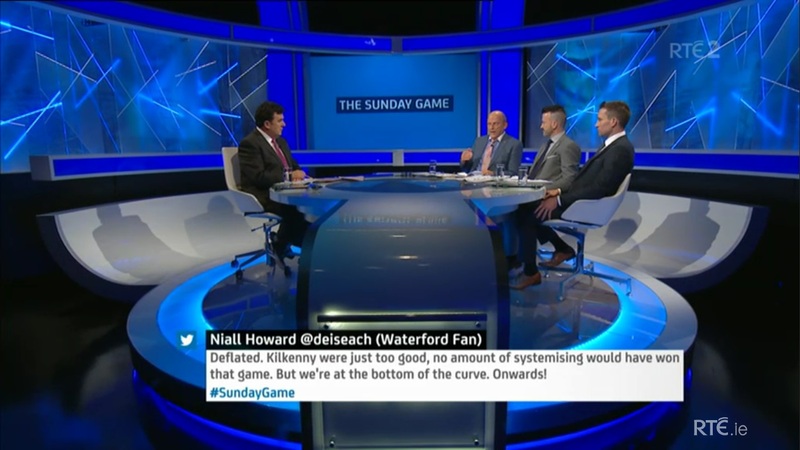 You have to be fatalistic if you are going to survive as a Waterford supporter, and even amidst the pleasure of the goals was the worry that this is what this Waterford team were about – goals keeping them in the game, just like in the Munster final replay. The self-belief was beginning to show though as Patrick Curran added a couple of frees and another effort from Stephen Bennett, this time a fine individual point, kept us ticking over at the same rate Kilkenny were doing. A two-point half-time lead felt slightly flattering, and there were numerous horrifying moments as they frequently played first-time balls which may be in the spirit of our hurling forefathers but is enough to give you a coronary in this age of defences hunting in packs. Waterford were on the ascendancy, struggling to win the ball first time but mopping up any loose play. Maybe the plan is to play to the strengths of players – in this case, their strength? Whatever it is, they hit the ground running in the second half, two fantastic early scores stretching the lead to four and causing me to put my camera away. I couldn’t pretend any more that I could be blasé about this. If we failed to win this one, it would be more sickening than several previous losses in HQ, low expectations that I had in those games. Kilkenny quickly hit back with two scores of their own and while it could hardly be said that the teams were now keeping it tighter the pattern was clear. Kilkenny were more of a unit but Waterford had the standout individuals, with Bennett, Foran and Patrick Curran making life very difficult for Kilkenny whenever they got the ball, the latter hitting the post with a 65 but showing no ill-effects by popping the ball over the bar when it was played back to him. The backs weighed in with a couple of great scores courtesy of Harney and the ever-industrious Austin Gleeson, and if we could match them score for score, we’d be home and dry. Easy! It’s been a summer noteworthy for the furore over red cards, and for a horrible few minutes it looked like that was going to be the case in this game. Flicking through match reports, I’m still not sure what happened to Shane Bennett as he picked up a second yellow card midway through the half. At the time I was right confused as it looked like the second yellow card had instead gone to a different player and Bennett had been given a straight red card for what could only have been giving the referee a bit of lip. The confusion was a by-product of the surreal surroundings. You’d normally hear a reaction in some section of even a tiny crowd at a decision, but when the red card came out, there was…nothing. As we fumed at what seemed like complete foolishness on his part, as opposed to the partial foolishness of picking up two yellows in this card-happy season, Waterford lost their way. Crucially though Kilkenny, unlike Cork a few hours later, failed to ram home their advantage. A few bad wides and suddenly the clock was against them. It’s probably a bit harsh to assume that a group of boys are potentially lacking characteristics of the adult teams that have ruthlessly put the boot in when a team was down. That’s not going to stop me thinking it though, i.e. that this group of Kilkenny hurlers lacked the characteristic of previous generation in ruthlessly putting the boot in when a team was down. Wishful thinking? I’m in a buoyant mood. Whatever about the future, the present saw Kilkenny fail to expolit the extra man and when Eoin Kenny also saw double yellow for them – referee evening things up, perhaps? – and DJ Foran got a spectacular point from distance to stretch the lead to three, once again pouncing on secondary ball and shrugging off the attention of two backs to score from distance, you felt we just had to keep them away from the goal to clinch the win. Kilkenny managed one point from distance, but there were three subsequent plays where you thought ‘if we can only win this ball, we’ll be fine’. And yes, I realise that makes no sense. Waterford duly won each of them to keep Kilkenny on the back foot and when Shane Hourigan blew up after a minute of injury time, Croke Park erupted. Okay, it didn’t. We did though. It was great. I had really thought I could school myself to be casual about the Minors, but this had been a plan of battle that had not survived contact with the enemy. They had taken on the Evil Empire and triumphed. For only the third time in my life, we can look forward to seeing a Waterford hurling team play in Croke Park in September. There are no words for the feeling. It was just great. And so we sat back to smugly enjoy the second game, passing all manner of arch comments about the Jacks and the Langers, confident that nothing could mar the splendor of the day. Hoi, weren’t you listening? I said nothing could mar the splendor of the day! For crying out loud . . . 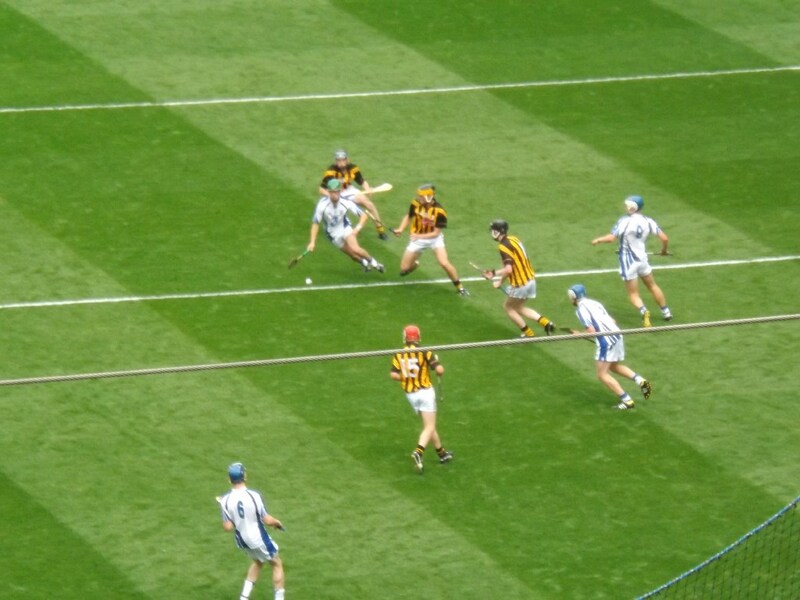 This entry was posted in Hurling, Match Reports, Waterford and tagged Croke Park, Kilkenny, Minor on 13/08/2013 by deiseach. This entry was posted in Hurling, Waterford, Waterford gallery and tagged Croke Park, Kilkenny, Minor on 12/08/2013 by deiseach. 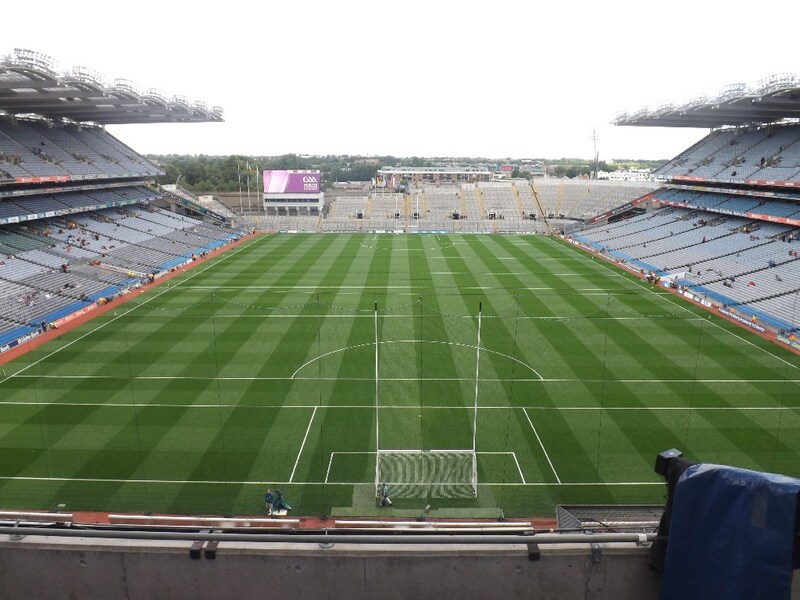 This entry was posted in Hurling, Waterford and tagged Croke Park, Kilkenny, Minor on 11/08/2013 by deiseach.